In contrast to yesterday’s expedition through temperate rain forests and alpine tundra, across the Canadian border and back to the bustling town of Skagway on the White Pass Yukon Railroad, on Thursday the Chichagof Dream arrived at Glacier Bay National Park. Early in the morning we picked up Matthew Miano, a ranger with the National Park Service, and Mary Jack, our Hoonah Tlingit cultural guide. Although the weather called for partly cloudy skies and a high of 40F, it was a clear sunny day. As we approached South Marble Island, we spotted steller sea lions, sea otters, pigeon guillemots, and puffins. Before this trip, I didn’t realize that colorful puffins also lived in Alaska and we were about to see two species along the rocky island; tufted puffins and horned puffins. It’s difficult to get a sense of the size of Glacier Bay until you’ve been sailing through it. For miles in every direction, the water sparkled like a blue jewel. We took an excursion in a small inflatable boat to explore the rocky shoreline of Reid Inlet. I imagine the excitement of the famed naturalist, John Muir, when he first stepped foot in this area in 1879. 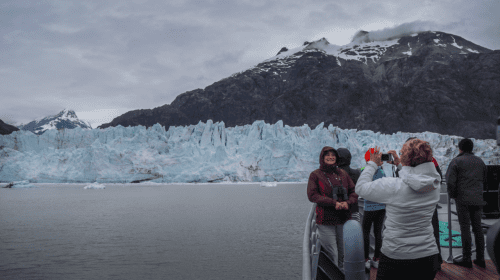 Having an up close view of The Reid glacier and the rocky shoreline the glacier left behind for us to stand on, it became clear the important role glaciers play in shaping the rugged landscape. We found a bear track in the sand and spotted a black oystercatcher on the shoreline among opened shells of countless blue oysters. A patch of nootka lupine reminded me that a local Florida gardener told me how rare in nature the color blue is but it seems to be pervasive here in the pristine wilderness of Glacier Bay. Our group’s assigned name was the “Sea Otters.” We were preparing to launch our kayaks to paddle to the face of Reid Glacier when the crew announced they spotted a whale off the stern of our boat. Although the wind had picked up, the prospect of being in a kayak with a whale somewhere around us was certainly exciting! 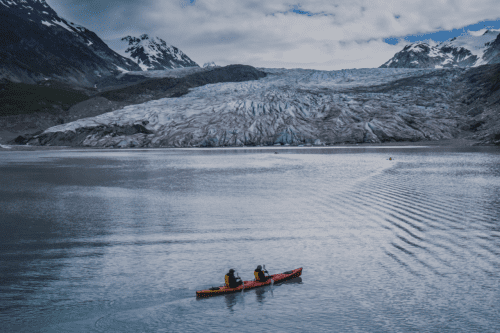 Our group launched from the Chichagof and paddled into the headwind toward the glacier. Although we were forced to turn around after twenty minutes or so, being on the water in a kayak paddling for the face of a glacier was certainly an adventure and an experience in contrast to paddling through my neighborhood lake in Florida to birdwatch and catch the sunset. After we departed Reid Inlet, our journey through Glacier Bay provided an ever-changing view of colorful scenery with waterfalls glistening in the sunlight and white snowcapped mountain peaks. After dinner, we arrived at Margerie Glacier. 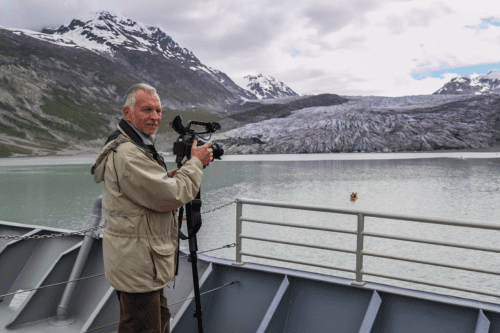 This stunning 21-mile long tidewater glacier is world-famous for its calving displays. Calving is when a huge chunk of ice splits from the face of the glacier and crashing into the water. Would we arrive at just the right time to see nature’s awesome display? Rising high above the water, the glacier’s jagged architecture seemed to resemble the shape of crystals. Waiting for the glacier to calve reminded me of sitting outside in the pitch dark waiting for a shooting star to streak across the sky. Standing face to face with one of the most powerful engines of nature was awe-inspiring. Then we heard the sound of a huge chunk of the glacier sliding down from the face and crashing into the bay. The sound of calving is referred to as “White Thunder” and it really did sound like thunder. As we departed, we noticed a sea lion frolicking among the miniature icebergs that were created by calving before we arrived.